It has been quite an emotionally exhausting few days for the disciples. The entry into Jerusalem was followed by extraordinary events in the temple, a Passover meal unlike any other, an intense experience in the Garden of Gethsemane, and unexpected betrayal from one of their own, an armed arrest, a series of denials, a pro forma trial, a jeering mob, and a bloody execution. This is followed by an immense feeling of defeat and disappointment, and perhaps even some shame, in the wake of what happened. Only a few days later they find out that Jesus didn’t stay dead, that the tomb was empty — not only that, but the alive-again Jesus even showed up a couple of times. There are only so many emotional ups and downs, only so much emotional turmoil, only so many waves of such strong emotions that a human can take. They were overwhelmed, and likely not even sure what to make of the last few days. “Let’s go fishing!” one of them says. Back to something they know, a semblance of routine, of order, of their past life. It was a life, which although not necessarily perfect, was theirs, it was a life that they had lost when they started following Jesus and it probably seemed as if it would finally be theirs again. So they go out fishing. They are fishing at night, which is not unheard of. Fishing at night can be very productive. It is quiet and still. Standing up in the boat, and very still, so not as to cause too much motion to scare the fish. There is a torch which offers them light. The night is ending, and the day is breaking, the sun rising just above the horizon. There was a man standing on the shore, who we know is Jesus but they didn’t know this — at least not yet. And this man yells out, “You don’t have any fish, do you?” The disciples reply back, “No, we don’t.” The man yells back, “Cast your net on the other side of the boat,” perhaps seeing a grouping of fish. So they cast their nets on the other side of the boat, and they found fish, just as the man had said. In fact, a lot of fish. The fish filled the nets, completely, but the nets don’t break, and they haul all of it into the boat. The disciple whom Jesus loved, a peculiar title only found in the Gospel of John, squints into the horizon at the man. “It’s the Lord!” he shouts to them. Peter, then, scrambles to compose himself, to ensure that he is properly dressed, and he dives in the water. The other disciples row the boat in along with all of those fish. When they get there, they see that Jesus has already started a barbeque grill — charcoal, they didn’t have gas then — and the coals are already heated and there are a few fish and some bread already on the grill. “Bring some of the fish you caught,” Jesus tells them. So Peter goes to the boat and drags in all of those fish, and they place a few of them on the grill. “Come and have breakfast,” Jesus invites them. Jesus then hands out bread and fish. 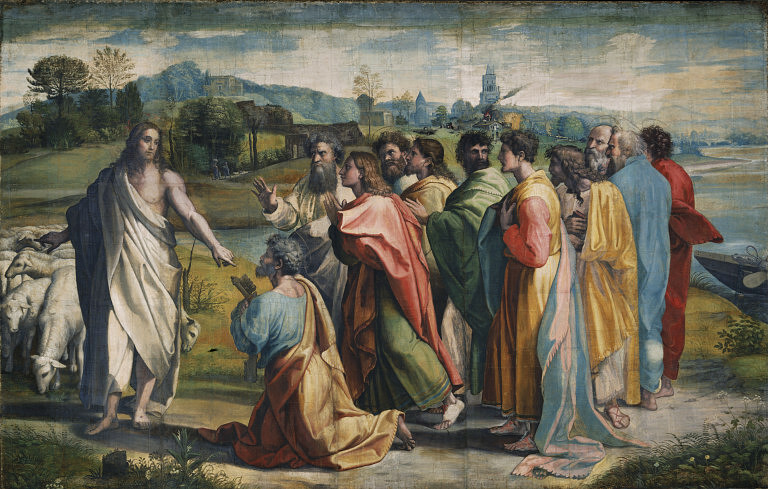 Now, this was the third time that Jesus appeared to the disciples after he was raised. Notice, that all of these appearances include physical activities. Touching, eating, drinking, making a barbeque grill, giving them advice on where to throw their net. This is so that we can know that Jesus was not just a vision or a ghost — after all, ghosts don’t eat, and visions don’t know where the fish are. So Jesus is in all of these very real and very physical situations to prove to the disciples that he is real, and they are recorded in these stories so that the readers will know this as well. They are eating, and they were likely conversing as well, sharing stories, sharing good times, talking about what has happened, all that has gone on, all that they have been through. As Jesus sat with them in the circle, perhaps he notices something…he only sees ten people in the circle, and that Peter is missing. Perhaps Peter sat outside of the circle, his back against a tree while the other disciples gathered. Remember Peter denied Jesus, just as Jesus had told him he would. He said that he didn’t know Jesus, he promised that he didn’t know Jesus, he even swore an oath that he didn’t know Jesus. All of which were lies, though, lies because he wanted to save his own skin. Perhaps Peter thought that lying would afford him a sense of security or stability that he wouldn’t have had he told the truth and told him that he was a student, and even a friend, of this Nazarene who had just been arrested. Chances are he wasn’t readily accepted back into the circle. You know what I’m talking about, perhaps they included him, but didn’t really and fully include him. They let him hang out with them, but they would all exchange glances with one another — each one knowing what they were thinking — but leaving Peter out of the real loop. So perhaps Peter was on the outside, physically and literally as well as metaphorically, with what happened clearly burned on his conscience. You don’t usually forget those things. He didn’t know how to move past it, he didn’t know how he could continue. I would imagine that he was conflicted — wanting nothing more than to see Jesus, but not really knowing how to do so — he probably had a lot of shame internalized — not just guilt, but shame. Jesus goes up to him, and as he approaches, Peter looks away, not really being able to look him in the eye. We don’t know what Jesus was referring to as “these”, but perhaps Jesus was waving his arm over their fishing equipment, over the nets, the boat, everything that Peter uses in his trade (Barclay). Perhaps Jesus is saying, do you love me more than your trade, more than your boat and your nets, more than your sense of stability and success, more than your ability to feel secure, more than your ability to live your own life and do your own thing, do you love me more than this? Peter is hurt because Jesus asked him yet again if he loves him. Perhaps Jesus didn’t believe him, perhaps Jesus was still angry about the denials. Perhaps he will never be included again. I don’t know if Peter realized it or not, but something very important happened here. Perhaps you didn’t even notice it. Two more times he was asked if he was a follower of Jesus, and two more times he said, “no.” It wasn’t until afterward that he realized what just happened. Just as Jesus said, just as Peter himself said would never happen. This is what is so interesting about this story, and what is so important about how God operates. This is how God interacts with us. Peter could have just said, “sorry” and Jesus could have just said, “Don’t worry about it, it’s nothing.” But it was something, it was something to Peter, it was something that he couldn’t forget, it was something that he went over and over again in his mind. Jesus, then, takes this horrible thing that he cannot get rid of, he takes this moment which is etched in his mind, and he turns it into something good. Jesus took denial and transformed it into a moment for a wonderful expression of love. Jesus takes his shame, takes his less than stellar actions, and transforms them into something new, something good, something life giving. But it wasn’t only then that this happened, this also speaks to us now. I think that we are invited to see ourselves in Peter. We are invited to see ourselves in Peter’s unsteady faith, we are invited to see ourselves in Peter’s denials, when we find that the easiest way is just to say, “I do not know him.” But we are also invited to see ourselves in this moment of Peter’s reinstatement, when Jesus takes the thing that likely bothers Peter the most, turns it around into something good, and then does something which Peter may never have expected, he issued an invitation to follow, again. Jesus was welcoming him back into the fold. Reinstating him as a disciple. Jesus does the same with us. We too have denied Jesus in words and actions, we have lived like we don’t know Jesus, like we don’t follow Jesus. Sometimes we recognize when we do this, many times we do not. At some point we will realize it, and we will be overcome with guilt and sometimes even shame. I hear it all the time. “I’ll come to church when I get my life together,” “I need to work through some things before I come to God,” “I’ve done some really bad things in my life,” people have told me. I think that all of us can relate to these things in our past that hang heavy over our heads. This entry was posted in Sermons and tagged Calling, Forgiveness, Redemption, Transformation on April 15, 2013 by Matthew van Maastricht.